Hotel ibis Darmstadt City. Book your hotel in Darmstadt now! Check into the ibis Darmstadt City and make the most of its close proximity to the city center - perfect for sightseeing, discovering the culinary delights and shopping. The main train station and congress center are just a 10-minute walk away. The greattransport links to other destinations in the Rhine Main area make this a great location for tours or business meetings. Whether for business or pleasure, you are sure to enjoy your stay in one of our 84 refurbished rooms. The newly designed rooms are soundproofed and air conditioned, offering plenty of comfort to help you feel at home. All our rooms have WIFI, flat-screen TV and a functional desk. 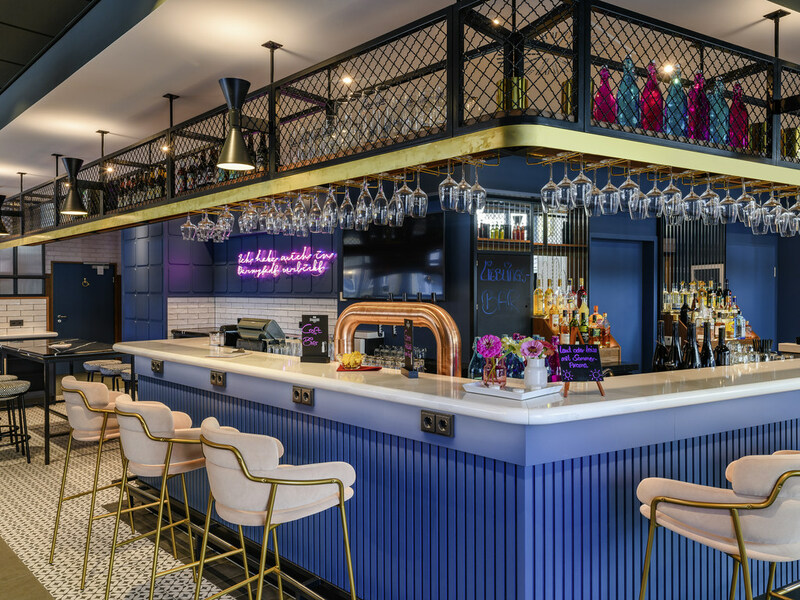 The newly designed bar/lounge offers a modern atmosphere where you can relax with a refreshing drink, coffee or light snack at any time of day. Ibis Darmstadt City has practical rooms, nothing more, nothing less: a comfortable bed, some desk space to work and a spatially efficient bathroom. Nasty in my bathroom was the smell of urine, which was not mine. So something had gone wrong with cleaning. The room was a bit too warm, and opening up the window caused too much noise (and pollution) from the street. Breakfast was nice, nothing wrong with that. What struck me most was the very impersonal attitude of staff near the reception desk. They seemed reluctant to greet people and help, very strange. Good breakfast, clean and comfortable room. Booked this hotel as no other hotel was available. Got what I expected: nothing. Not worth the money. Hotel wanted a unsusual payment at check in instead of at check out. Welcomed by front desk employee with a cheery smile. Nice clean and comfortable room. Room was cleaned and well made up each morning. Ok although the check out experience really spoilt my experience. All was ok apart from the check out experience. The receptionist demanded I pay for my stay despite me claiming I had already paid online. It was very embarrassing !!! Reluctantly I had to pay again then for some reason (it was never explained why??) another assistant came over AFTER I had paid again, spoke to the other assistant and then I was told I wouldn't have to pay again. It was extremely embarrassing and amazingly no reason was given or sadly, any apology was offered. This really spoilt my day and whether I use Ibis again is undecided. I´m mean its IBIS. You know what you get everything is equal no matter where you are in the world. Recently they started to refurbish the hotel. Fresh painting, new room access system. Freh design in the breakfast room. One very ositive thing - this is the hotel very I have always the shortest check in time. This was consistent over the years and goes back to engaged personell. The hotel is nicely located to the main city centre and is easily reachable via tram (#5). The hotel is a standard Ibis Hotel, is well-kept, the staff very friendly and the Internet connection more than adequate and easy to use. Tipical Ibis hotel (structure, furnitures, colours, etc...) located inbetween the City and the Motorway. Quite easy to reach, offers all possible services (except restaurant) you may need during your trip. Friendly personnel. Clean, Comfortable, very good sleep quality. It is a good stay for value as usual. If you want to sit in bed and lean back, the bed moves forward since it is not attached to the wall or to the ground. That has been an issue for years. You can hardly read anything in comfort in bed. Dear 59asim, thank you for your review. Your review is very important to us. I have stayed many many times here for the last 15+ years. Unless it is fully booked, I only stay here when I am at Darmstadt. Very good location. Friendly staff I recommend the hotel for business and also for family stay. Dear vijay_kumar88, thank you for staying with us. It is a pleasure that you enjoyed your stay at our hotel. Dear sparky_112358, thank you for staying with us. Your opinion is very important for us. everything was good, I had a quiet comfortable stay. the room was clean, well designed, with enough light. It was vey quiet as well airconditening works well, the reception also was a very nice gentelman. give it a try! Dear 881amint, thank you for your review. It is a pleasure that you enjoyed your stay at our hotel. This Ibis Hotel is peculiar. You get immediately the feeling that there is something different. This time including the elevator stay broken during my journey (4 days!). If you think that doing a check in online is good to gain time in your arrival, you will get a bad surprise. They reserve a value significantly higher in your credit card and when you get a message from the credit card it was not clear that would be only a reserve. Last April I came to the same hotel and I arrive around 13:00, for sure, there was some room already ready, but they leave me waiting in the reception up to 15:00, however, after 14:00 I did not see any other cleaning personal in the hotel, so all rooms should be ready at 14:00! Dear Schuetzer, thank you for your review. Your opinion is very important for us. I stay at this hotel every month and for the previous two stays the lift has broken but been mended in a few hours. Seems it's finally given up as it was broken for the whole week. Sign said you could use the one next door & walk across, never tried as I was on the 1st floor. I was surprised it was left for so long though. Dear JournoEngland, thank you for your review. Your opinion is very important to us. Clean, efficient and centrally located. However, the train station is not within close proximity. So if you arrive by train and have luggage, consider public transport or taxi. Otherwise, the hotel is typical Ibis: sparse, quite clean and just a place to sleep and shower. Also, a couple of nearby eateries but be aware that they close early. Dear 316caesarp, thank you for your review. Your opinion is very important to us. The hotel location is near the center of the country & very near to my friends, all transportation are passing the hotel so there is no difficulty to reach the hotel. Rooms are wide & always clean. The view is also very nice. Dear nivine2017, thank you for your review. It is a pleasure that you enjoyed your stay at our hotel.